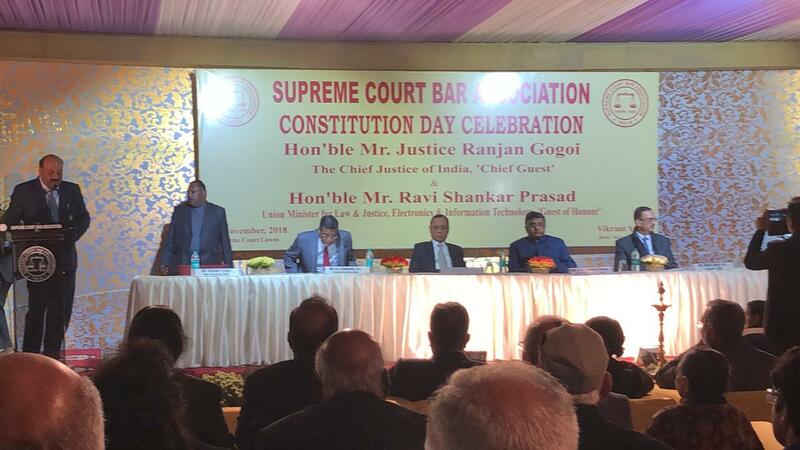 The day-long celebration of the Constitution Day at the Vigyan Bhawan in New Delhi was the exclusive initiative of the apex court, with the government having no role to play in its organisation, clarified Chief Justice Ranjan Gogoi on Monday evening. The Chief Justice was speaking at a subsequent function hosted on the Supreme Court lawns by the Supreme Court Bar Association to commemorate the 69th Law Day, which also saw in attendance the Union Minister for Law, Information Technology and Electronics, Shri Ravi Shankar Prasad. At the SCBA event, Chief Justice Gogoi, who in the morning had warned that if advice of the Constitution is not heeded, this “hubris” would bring about the “descent to chaos”, regarded ‘fairness’ to one and all as the central Constitutional ideal, an adherence to which could ameliorate most issues. In his turn, the Union Law Minister congratulated the top court for its incessant endeavour to not allow the rule of law to be sacrificed regardless of any adversities that there might be. He hailed former Supreme Court Justice H. R. Khanna’s grit in dissenting from the majority in the 1975 ADM Jabalpur case and upholding the right to life and liberty as inalienable even in the face of a National Emergency, though he was aware that the act could earn him the ire of the then-government, costing him the office of the Chief Justice. The Minister made a reference to an editorial published in the New York Times in those days which had predicted that should democracy ever return to India, a monument would be erected to Justice Khanna for fearlessly rooting for freedom and dignity. “Today, court 2 (of the Supreme Court) holds a portrait of Justice Khanna”, he remarked. Attorney General K. K. Venugopal also complimented the apex court for infusing life into Article 21 by means of its interpretation and according to the right of life and personal liberty a flesh-and-blood embodiment.